held outside of New York. Chicago is the host city for the coveted May 4 event taking place at the Lyric Opera of Chicago. Tickets are $500 for the general public and $450 for James Beard Foundation members. 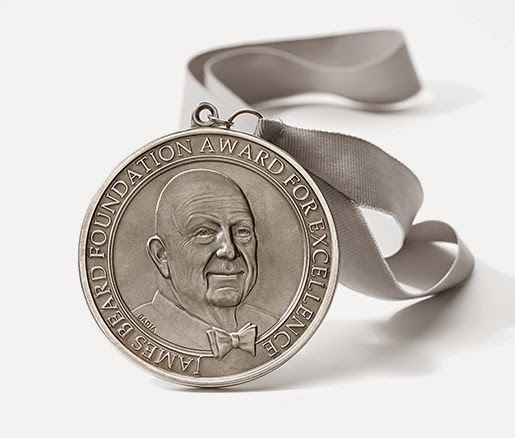 For those unfamiliar with the awards, the James Beard Awards are to the restaurant industry as the Oscars are to the film industry. Below are the finalists for the 2015 Restaurant and Chef Award categories, from Outstanding Restaurant to Rising Star Chef of the Year. Winners will be announced on May 4, 2015. Richard Melman of Lettuce Entertain You Enterprises will receive the 2015 James Beard Foundation Lifetime Achievement Award. Carla Hall will host our Book, Broadcast, and Journalism Awards Dinner, taking place at New York City's Pier Sixty at Chelsea Piers on Friday, April 24. Tickets to the main gala go on sale April 1, while BBJ ceremony tickets are now available online. The Feed Podcast with hosts: Rick Bayless and Steve Dolinsky; producers: Matt Cunningham and Steve Dolinsky which airs on: soundcloud.com/thefeedpodcast was also nominated under the category podcast. The Hungry Hound, host Steve Dolinsky and producer Irit Nayden which airs on: ABC 7 Chicago were nominated under the television segment category. 75 Seats and Under (for the best restaurant design or renovation in North America since January 1, 2012).